Say “hola” to your new favorite restaurant! If you crave authentic comfort food, served on the clear blue waters of the Mexican coast, then you’ll love La Cantina at Vidanta Riviera Maya. We’re beyond thrilled to be sharing this new eatery in our first ever Taste Spotlight, which offers you an in-depth look at Vidanta’s exclusive dining options—You’ll learn what makes each location unique, with insight from our staff, and a simple but top-secret recipe; from our gifted team of experts to you, our cherished reader! La Cantina at Vidanta Riviera Maya is the perfect complement to the original restaurant located by The Grand Mayan at Vidanta Nuevo Vallarta. While both feature live Mariachi bands and serve delicious, fresh food, the original spot is famous for its bright colors and vibrant décor, as well as the front-row seat it provides for Nuevo Vallarta’s The Lake Show. On the other hand, La Cantina at Vidanta Riviera Maya offers travelers a more relaxed and casual option. 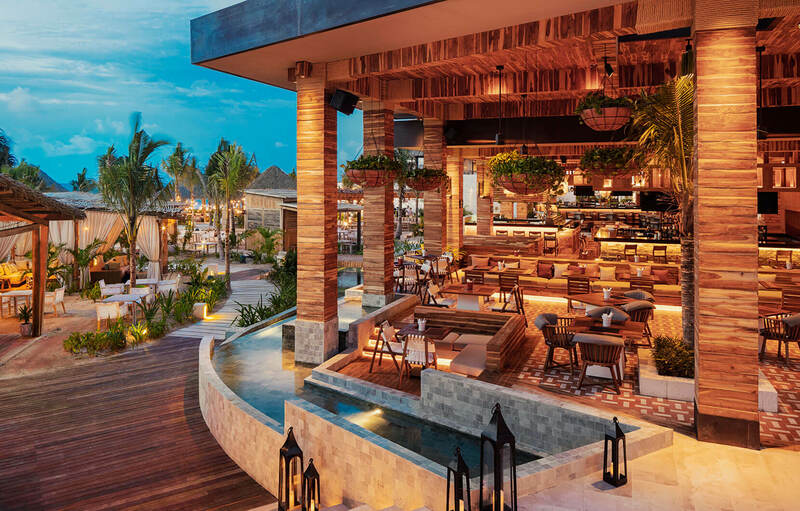 This new restaurant is situated in Salum Beachside Eateries and Market, the bohemian Tulum-inspired village located next to the shores of the Caribbean. Nestled alongside food stands, shops, lively bars, hammocks, and live music, this new spot has a much more chilled-out vibe, showcasing views of the breezy paradise-perfect surroundings. The beachy, laid-back Salum is the perfect place to unwind during vacation. But Francis wanted to make clear that the décor wasn’t the only exceptional thing about La Cantina. “All our tortillas are made fresh and on the spot right before serving.” He went on to comment that, hands-down, his favorite dish is the Caribbean ceviche. How does the striking delicacy get its dark, almost black color? “It’s a mixture of local spices and chili peppers from the region, which are roasted until they reach carbonization and then are diluted in locally grown citrus juice, giving you an explosion of flavors.” Sign us up! Want to try out some of the flavors of La Cantina but can’t wait until your next trip to Riviera Maya? Here’s one of its signature cocktails, straight from the beautiful tiled bar to you. 1. Place the domino sugar in an old fashioned glass and splash the angostura bitters on top. 2. Dissolve the Angostura Bitters with the sugar then pour in the Mezcal. 3. Add ice (preferably a large cube or sphere of ice) and gently stir. 4. Twist the orange peel to activate its aroma and drop inside the glass.